Since 2014, I have critically questioned the situation at Memorial Field. Between demands for transparency and countless community meetings, organizing for action on restoring glory at our sacred park has remained one of my top priorities. The state of decay at Memorial Field is representative of the state of local government dysfunction. It represents how far we have fallen from athletic grace. It represents how much work we must do to bring our community back. For years we have impatiently waited for the moment to bring justice to those that were involved with destroying our park. Based on recent admissions, we can finally start an aggressive pursuit for justice for Memorial Field. 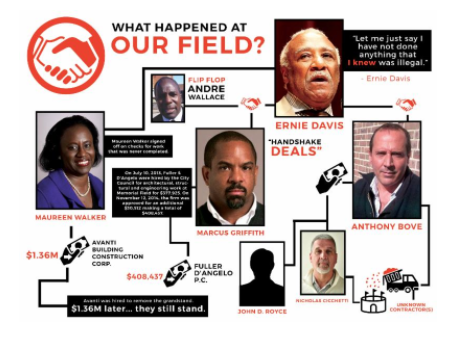 Yesterday, subpoenas were issued against former Mayor Ernie Davis, Comptroller Maureen Walker, City Councilman Marcus Griffith, John Royce, Nicolas Cichetti, Anthony Bove and others in connection with the illegal toxic dumping that occurred at Memorial Field. The subpoenas, issued in conjunction with a special proceeding filed in the Supreme Court of Westchester, are necessary to preserve evidence and identify potential defendants. We all know the sad story of the crimes that were committed at Memorial Field - the bribery, the illegal dumping of over 12,000 cubic yards of construction debris and other materials containing contaminated substances. The recent news reports that a "handshake deal" by the prior administration was responsible for the toxic dirt at the Field is heartbreaking, frustrating, and requires a response. We have called upon the contractor that was paid over $1 million to demolish the grandstands to come back and finish the job, at no cost to the taxpayer. It's time to bring those responsible to justice! It's time for them to come clean about what really happened at our par. Many may ask, why a lawsuit? Why not just let this go? We have lost a decade of our park. We have lost the opportunity to make beautiful family memories, to walk on our track, to play and come together as a community. We will not lose anymore! When I entered office as Mayor, I had every expectation that the City Council and Comptroller would work collaboratively with me to fix Memorial Field. Three restraining orders later, we learned that only sabotage and political animus matters to them. Though we have been repeatedly rejected by our colleagues in government, we will continue to invite them to the table to fix Memorial Field and work together to fix the broken system. At this point, lawsuits are the only option available to successfully get to the truth; for a community to receive economic and restorative justice. The cost to clean-up and fix Memorial Field will run into the millions of dollars. We, the people, should not have to pay this! Those that are responsible should! We know we were lied to. We know a crime was committed and our park was dumped. The people of Mount Vernon are entitled to justice! I will not give up on getting Memorial Field Moving Forward.